Between Obama receiving the Nobel Peace Prize in Oslo, Norway and these mysterious lights in northern Norway much is going on in Norway. The Daily Mail has photos and videos of this oddity. As the Daily Mail reports, the lights were not seen by many. Lenticular Clouds, Northern Lights, and other natural phenomenon could be a cause. Some are propose the mysterious lights are caused by a missle from Russia. The Russian military of course denies this. Others say it might be a UFO of extraterrestrial origin. 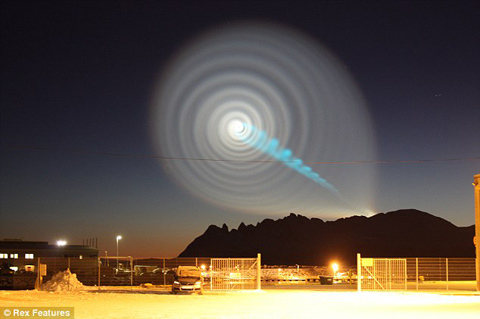 Who knows maybe its a natural phenomenon, missile, or UFO. Or maybe Sarah Palin is pissed at Obama and summoned her buddy Thor. EDIT: Yeah, it was a rocket. But a rocket spewing out tiny sapphires! Not Thor, but still cool.